This is the first post of a series on application performance data visualization. I’ll cover a simple but extremely useful technique that allows you to visualize the application behaviour against different workloads. Before we get our hands dirty I need to explain a concept called service time (S). Service time is the time that a resource in your system is busy during a given transaction. The resource may be physical, like a disk or a processor, or logical like an application process or a thread. If your system is, let’s say, a store, you can think of the counter as a resource in your system. The time the counter takes to check out would be its service time. It’s easy to understand that the counter will take more time to check out a hundred items than it takes to handle just a couple of items, so its service time is directly related to the amount of work (or load) it is subjected to. We’ll not delve into details like resource sharing for now, but keep in mind that in a real system frequently the service time is not related only to the load of an individual resource. When I first started to figure out the importance of the service time in application performance evaluation, I was amazed to discover that many popular softwares had no way to register the service time for a given transaction while others did it in a poor and almost useless way. As an example, nginx would log the time to serve a request in seconds before version 0.5.19. Consider that an HTTP request usually takes less than a single second for most websites and you can figure how useless this is. Currently, nginx has a variable called $request_time that allows you to log the time it takes to serve a request in milliseconds. The Apache Web Server has a directive called %D that logs the time it took to serve a request in microseconds. You can find more information about the Apache log directives in the mod_log_config documentation. Unfortunately neither of these options is enabled in the default configuration files so you need to manually configure these options. I’ll use Apache 2.2.3 running on a CentOS 5.5 system as a testbed for this article. While it’s beyond the scope of this article to describe the Apache configuration directives, I’ll try to make it simple for someone not familiar with the software to understand what we’re doing. I’ll edit the Apache configuration file located at /etc/httpd/conf/httpd.conf (remember to make a backup of the original file before commiting any changes) and look for the existent LogFormat directives. If you’re not in a production server starting the httpd should be pretty straight forward, we don’t need any further configuration. Just make sure you allow incoming connections to the TCP port 80 if you’re running any kind of firewall (CentOS will enforce security constraints by default). So now we have the time the server receied the request and how long it took to serve it. In this example I’ve used the standard Apache 2 Test Page, a static HTML with some images. The longest request took 0,037 seconds and the fastest took 0,0015 seconds. Obviously using data from a local server will be not be useful unless for benchmarking purposes. We’ll use production data from a live website for our analisys. This data was collected for one day on a relatively busy website. In order to harness all this data we’ll use some Perl scripts and R. If you feel like using Python or any other programming language, stay at ease and don’t forget to share it ! You can download the Perl script that I use to summarize the Apache log files here. 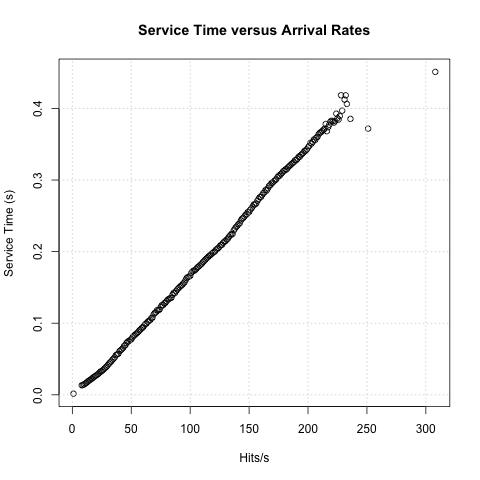 I’ll begin by plotting a simple scatter plot that correlates the arrival rate with the service time, this gives us an idea of how the server handles traffic. Note that I’ve converted the Service time to seconds simply by multiplying it by 10E-6. 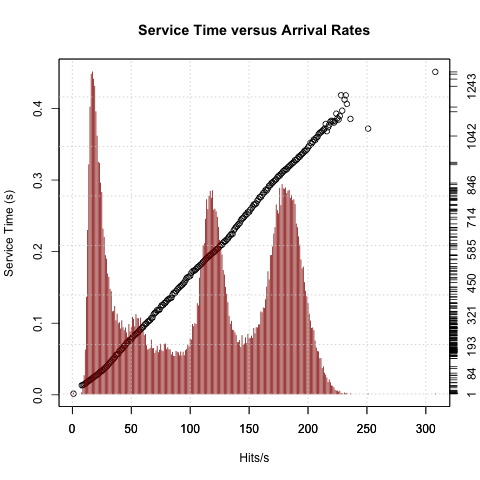 So here we can see an almost linear relation between the arrival rate and service time, and a slightly irregular behavior when we reach more than 200 hits per second. Bear in mind that this may be caused by the lack of samples, so you may filter the data and remove service time values when you don’t have enough data samples, there’s no rule of the thumb for that. Service time and arrival rate can be very useful in order to determine the behavior of your system in different workloads, as well as help you to discover what is the current load that your system is subjected to. The techniques presented in this article can be used for almost any system as long as it provides a way to register the service time. It’s important to note that it takes some effort to realize how to extract information from the raw log files, but once you understand the data there’s a lot of useful information that may help you in capacity planning and even in troubleshooting some quirky behaviour in your systems. Feel free to contact me if you need any further information, I appreciate your feedback.